Edited by Scorched, 16 September 2015 - 06:50 PM. I just want to commend you on the labeling of your pods. 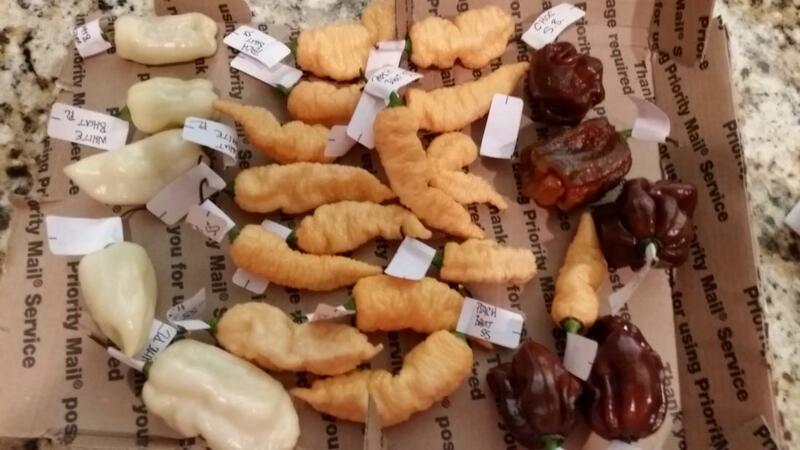 I certainly wish every seller would make the effort to identify each pod or group of pods. I know it may be time consuming, but I would certainly pay a premium for that service. Interested in a box please! Edited by Spicy Joe, 09 September 2015 - 05:08 PM. Time consuming it is lol. I do it mainly for myself. I've got so many varieties that if I tossed em all in the basket I'd never know half of what I have once I get everything in the house. Some stuff you can tell by shape but a lot looks similar. I would guess that most people on this forum buy a SFRB of pods so that they can "Look", "Taste", "Collect" for their next seasons grow. Too many times I have received a SFRB full of pods and have been unable to identify individual pods. If I can't identify the pods, I can not use the seeds in my next years grow. Edited by winland, 09 September 2015 - 05:25 PM. Mine arrived this morning, thanks man, just as fresh as if I'd have picked them from out back. It's salsa and College Football today!! Roll Tide Roll!! !